There is no oxygen in groundwater. The oxygen is replaced with other gases like hydrogen sulfide and methane. In the following filtration oxygen in the water is very important. 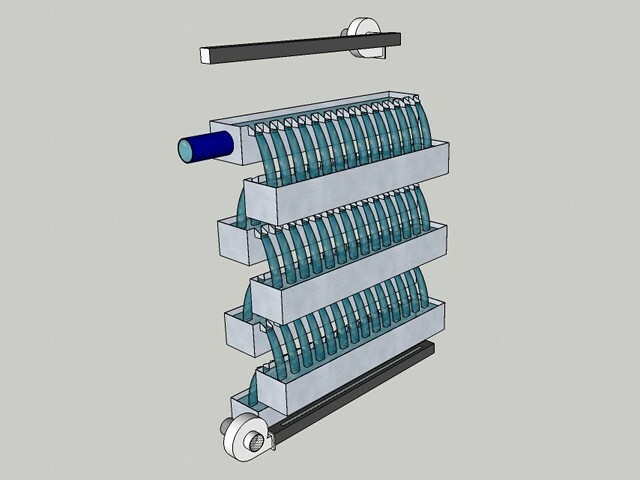 The cascade aeration is a method to replace the unwanted gases with oxygen. The exchange of gases takes place when the water plunges into the next container. The ventilation system supplies fresh oxygen and takes out the unwanted gases. On the photo you can see the water falling from one container to the next. When the water stream hits the water in the next container the unwanted gasses like hydrogen sulfide and methane are expelled and replaced with oxygen. 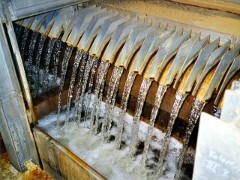 The cascade is made from stainless steel. This material is resistant to the corrosive gasses, and is easily cleaned, with for example a high pressure washer. On the photo you can see brown staining, this is from the iron that was dissolved in the water but has oxidised because of the oxygen. 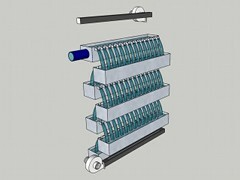 Look at an video presentation of a cascade aeration.